Background The examination of ciliary ultrastructure in a nasal sample remains a definitive diagnostic test for primary ciliary dyskinesia (PCD). Methods The quantitative assessment of ciliary ultrastructure in the diagnosis of PCD over a 20-year period was reviewed. Results During this period, 1182 patients were referred for ciliary ultrastructural analysis, 242 (20%) of whom were confirmed as having the disease. The two main causes of PCD identified were a lack of outer dynein arms (43%) and a lack of both inner and outer dynein arms (24%). Other causes included transposition, radial spoke and inner dynein arm defects. 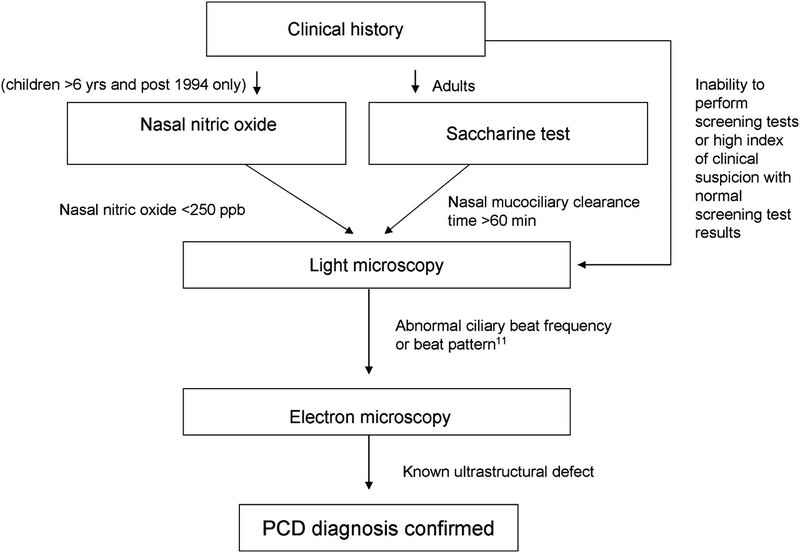 No specific ultrastructural defects were detected in 33 patients (3%) diagnosed as having PCD on the basis of their clinical features and screening tests that included a low nasal nitric oxide concentration or slow saccharine clearance and abnormal ciliary beat frequency or pattern. Conclusions Electron microscopy analysis can confirm but does not always exclude a diagnosis of PCD. Example of normal ciliary ultrastructure. Although a nasal brush biopsy typically contains 1×106 ciliated cells, only 3000 cilia may be seen in the electron microscope10 and, because of their varying orientation, most of these will be unsuitable for full analysis. To overcome this problem, less than perfectly orientated cilia may be assessed for defects in the microtubular axoneme, with the dynein arms being assessed only in those cilia in which these small structures can be discerned. This paper reviews our utilisation of a quantitative method first reported in 1988,11 as applied to the diagnosis of PCD over the past 20 years. Between 1988 and 2008, nasal epithelial samples from 1182 patients suspected of having PCD were submitted for electron microscopic assessment. Patient age ranged from 16 days to 83 years, with a median of 8 years. Selection was based on a suggestive clinical history supported by certain screening tests as detailed in Figure 2. Algorithm for the diagnosis of primary ciliary dyskinesia (PCD). In the clinical assessment, particular attention was paid to the patient's birth history (infantile respiratory distress being a good indicator of PCD12), family history, upper and lower respiratory tract symptoms, cardiac symptoms and physical examination.4 Where feasible, testing was not undertaken within 6 weeks of an upper respiratory tract infection. The screening tests included nasal mucociliary clearance by saccharin test (1988–2006) and/or the measurement of nasal nitric oxide concentration (1994 onwards) performed on adults and older children able to complete the procedure(s).13 14 Nasal nitric oxide was measured using a chemiluminescent analyser sampling at a flow rate of 250 ml/min.14 Nasal brush biopsy was undertaken if the saccharin test exceeded 60 minutes, or the nasal nitric oxide concentration was <250 ppb, or there was a strong clinical history. To obtain biopsy samples of the nose, strips of mucosa were scraped from the inferior turbinate with a cytology brush.15 The biopsy sample was placed in M199 maintenance medium and examined by light microscopy to assess ciliary beat pattern and frequency. From 1988 to 2006, ciliary beat frequency was measured by photometry15 but, from 2006, high-speed video microscopy was used.16 Electron microscopy was undertaken if either the ciliary beat frequency or the pattern of beating was abnormal. Survey sections (1 μm thick) were stained with toluidine blue and examined by light microscopy to select the area with the most cilia cut transversely. Ultrathin sections of this area (80–100 nm thick) were stained with methanolic uranyl acetate and lead citrate and viewed in a transmission electron microscope. Attention was confined to cilia on healthy intact epithelial strips and counting was conducted methodically across the section. Figure 3 shows an example of such quantification in a patient with a radial spoke and inner dynein arm defect. 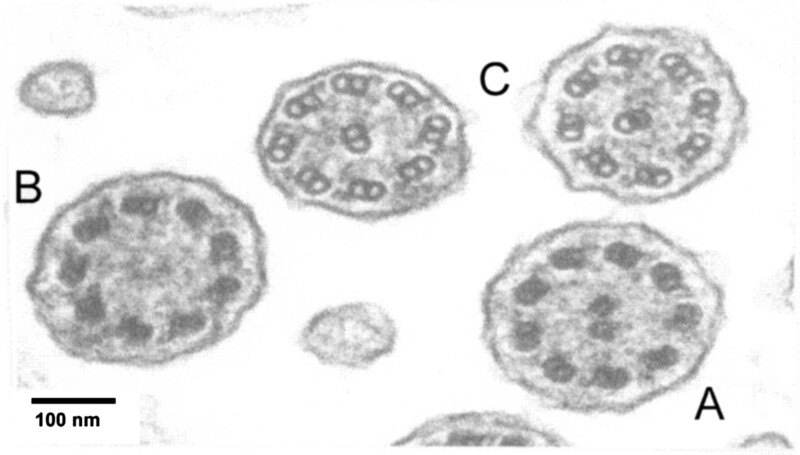 Cilia in less than perfect cross-section but in which the microtubular arrangement could be recognised were recorded with a cell counter as being normal (9+2 microtubules) or defective (figure 3, top line). The results were recorded in batches of 100 counts, assembling as many such batches as possible from a single section, and thus any pattern would be revealed. Dynein arms were assessed in any high-quality cross-sections encountered during the recording of microtubular arrangements. They were documented as showing the presence of both arms, or only an outer or inner arm, or neither arm (figure 3, bottom line). If the presence of an arm was equivocal, it was counted as being present. If a single arm was seen, dynein arms of that type (e.g, inner or outer) were counted as present on that cross-section. Ciliary profiles showing the clear presence or absence of dynein arms were photographed for reference purposes. Counting sheet currently used with electron micrographs added to illustrate microtubular (top line) and dynein arm (bottom line) defects. This example shows the counts for a patient with a radial spoke combined with an inner dynein arm defect. Note that counts are recorded after every 100 microtubular counts which reveal a pattern of defects repeated throughout the sample (ie, the top line shows disarranged microtubules as a feature and the bottom line shows a consistent inner arm defect). * This column contains a mixed group of other defects not represented in the other columns. Other defects include eight outer doublets with or without a central pair, two central pairs or transposition arrangements. Because defects are evident in only a small proportion of ciliary cross-sections in some causes of PCD (e.g, transposition), a relatively large sample is required to ensure that different levels of the cilia are examined. We based our counts on 200–300 cross-sections of which approximately 30% were assessed for dynein arms. Finally, the quality of the specimen was recorded, noting the epithelial integrity, any evidence of infection or inflammation, the degree of ciliation, the orientation of the cilia (based on the orientation of the central pair17), the layout of microtubules in longitudinal sections, changes throughout the length of the cilia and the consistency of any abnormalities throughout the sample. Over the 20-year period, five electron microscopists used this counting method and recorded their results in our PCD database. A diagnosis of PCD was confirmed by electron microscopy in 242 (20%) of the 1182 patients (table 1). Those diagnosed with PCD ranged in age from 16 days to 77 years, with a median of 10 years. 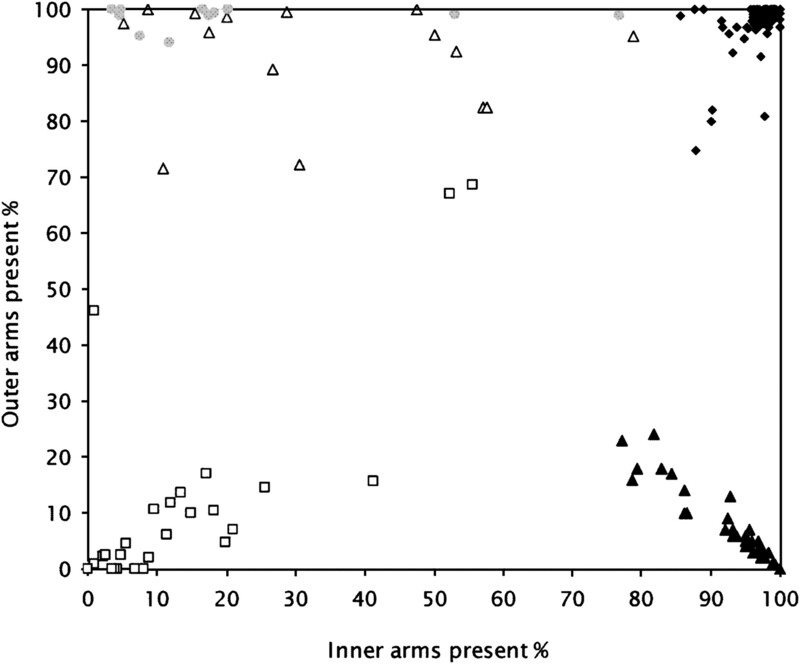 The average counts of inner and outer dynein arms where more than 100 cross-sections were viewed are shown in figure 4. The counts for dynein arms using this counting method showed a wide spread. However, there was no crossover with the respiratory control group. In patients with a dynein arm defect, absence of one or both dynein arms ranged from 16.5% to 100% of profiles, with a median of 85%. Percentage dynein arm defects at electron microscopy in patients with primary ciliary dyskinesia (PCD) and non-PCD patients. Each point represents one case for which more than 100 cross-sections were assessed for the presence of dynein arms. The different arm defects form clusters and, while there is variation within a cluster, they do not overlap. Solid diamonds, non-PCD patients; open triangles, inner dynein arm defect; solid triangles, outer dynein arm defect; open squares, outer dynein arm and inner dynein arm defect; shaded circles, inner dynein arm and radial spoke defect. Radial spoke defects were associated with microtubular disarrangement in 41±12% cross-sections per case. With the exception of two cases, radial spoke defects were associated with an absence of the inner dynein arms. In transposition defects a mean±SD of 15±10% cross-sections showed an absence of the central pair and 10±10% had transposed doublets (see figure 5 as an example). These transposed doublets tended to occur distally. An electron micrograph of a transposition defect from a patient with confirmed primary ciliary dyskinesia (PCD). Transversely cut cross-sections of the axoneme show (A) normal ultrastructural arrangement, (B) absence of the central pair of microtubules and (C) transposition of an outer microtubule doublet into the centre of the axoneme. No examples of the rarer phenotypes reported in PCD such as abnormally long cilia, hockey stick cilia or ciliary aplasia were encountered.8 18 Examples of ciliary disorientation17 that were not evident on repeat sampling were considered to represent secondary changes. Ultrastructure was largely normal in 789 patients. Data are presented for 510 patients in whom >200 cilia were examined (figure 4 and table 2). Abnormalities accounting on average for <10% of the sample were considered to be within normal limits. However, 33 patients judged to have normal ciliary ultrastructure were still considered to have PCD because they had a strong clinical history, low nasal nitric oxide concentration and abnormal ciliary motility. Samples were inconclusive in 265 cases; 131 cases were not referred back to the service but repeat biopsies were performed in 134 cases, either because there was insufficient material (n=93) or it was unclear whether transposed, disorientated or disarranged cilia represented a primary defect or secondary change (n=41). A third and even a fourth biopsy was required in 16 cases. In total, 20 cases (15%) remained inconclusive even after repeat biopsy. We tested 128 family members of 57 different families for characteristic ultrastructural abnormalities associated with PCD: seven families had only one affected member while 17 had two or more family members with the same PCD defect (table 3). Five families had more than one sibling believed to have PCD but normal ultrastructure. We report a large group of patients diagnosed as having PCD by transmission electron microscopy using a rapid quantitative method that has enabled us to deliver a prompt and reliable service, currently dealing with 250 samples of possible PCD per year. Several genes are responsible for dynein arm proteins, and a number of isoforms of dynein are distributed differentially along the length of the axoneme.12 21 As a result of this heterogeneity, a spectrum of defects is seen under the electron microscope and the number of cilia cross-sections affected can vary from case to case. The inner dynein arm repeats less frequently and is more heterogeneous than the outer dynein arm,22 which may possibly explain why the structure of the inner dynein arm is more difficult to visualise than the outer dynein arm. The spread of inner arm defects in figure 4 compared with the tighter clusters representing outer arm defects may also be a reflection of this. With radial spoke or transposition defects, the variability is also due to the microtubular defect occurring distally and therefore not being evident close to the cell membrane. The electron microscopy findings should be considered within the clinical context and in conjunction with other test results, including nasal nitric oxide concentration and ciliary beat frequency and pattern analysis. These tests should preferably be completed before electron microscopy is undertaken. There are a number of diagnostic advantages of applying this quantification method. First, it allows relatively rapid assessment of a large number of cilia rather than concentrating on a small number of perfect cross-sections. This is important since we have shown as few as 10% of cross-sections (in transposition defects) can demonstrate the primary defect. It also allows identification of a pattern of defects throughout the sample. Second, it allows precise comparison between biopsies at different times and with different observers. The generation of a normal range for non-PCD respiratory samples means the clinician can be alerted to samples which fall outside the normal range of counts. In conclusion, quantitative electron microscopy following positive screening tests led to the diagnosis of PCD being confirmed in 20% of our cases. However, electron microscopy does not always exclude a diagnosis of PCD. Formal quantitative electron microscopy can be successfully used to confirm the diagnosis of PCD. However, electron microscopy alone does not always exclude a diagnosis. This JCP article has an accompanying set of multiple choice questions (MCQs). To access the questions, click on BMJ Learning: take this module on BMJ Learning from the content box at the top right and bottom left of the online article. For more information please go to: http://jcp.bmj.com/education. Please note: the MCQs are hosted on BMJ Learning the best available learning website for medical professionals from the BMJ Group. If prompted, subscribers must sign into JCP with their journal'susername and password. All users must also complete a onetime registration on BMJ Learning and subsequently log in (with a BMJ Learning username and password) on every visit. The authors thank the electron microscopists Andrew Rutman, Kelly Pritchard and Nandi Simpson and the consultant clinicians Professor P Cole, Dr R Wilson, Professor J Warner, Professor A Bush and Dr C Hogg. ; ERS Task Force on Primary Ciliary Dyskinesia in Children. Factors influencing age at diagnosis of primary ciliary dyskinesia in European children. Eur Respir J 2010;36:1248–58.
. Primary ciliary dyskinesia: diagnosis and standards of care. Eur Respir J 1998;12:982–8.
. Cilia-related diseases. J Pathol 2004;204:470–7.
. Central microtubular agenesis causing primary ciliary dyskinesia. Am J Respir Crit Care Med 2004;169:634–7.
. Transposition of ciliary microtubules: another cause of impaired ciliary motility. N Engl J Med 1980;303:318–22.
. Candidate gene analysis in three families with acilia syndrome. 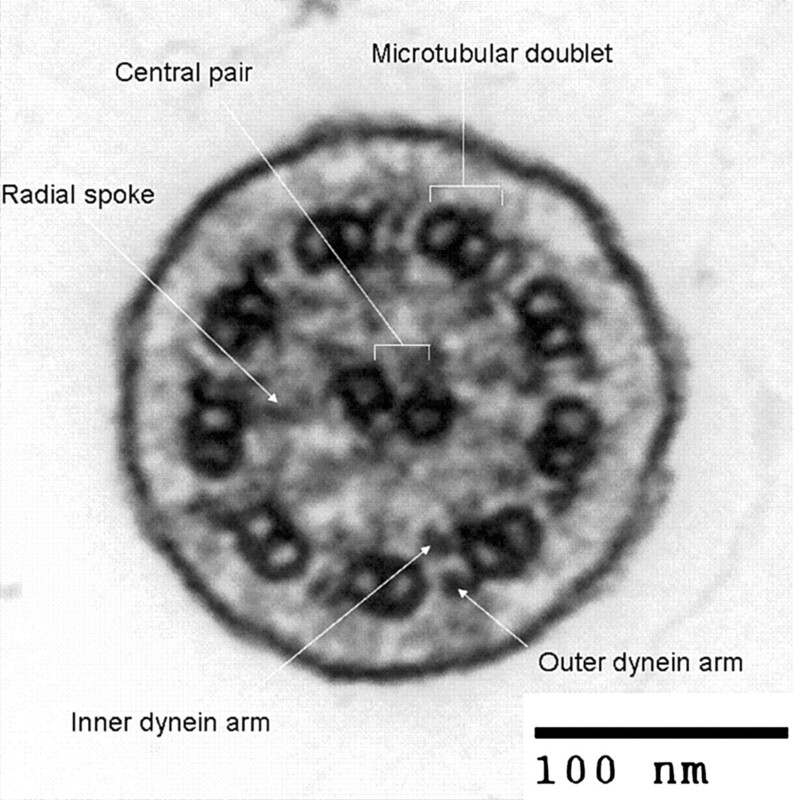 Am J Med Genet 2008;146A:1765–7.
. Cilia with defective radial spokes: a cause of human respiratory disease. N Engl J Med 1979;300:53–6.
. Nasal brushing for the study of ciliary ultrastructure. J Clin Pathol 1982;35:357–9.
. Primary ciliary dyskinesia: cytological and clinical features. Q J Med 1988;67:405–23.
. Clinical and genetic aspects of primary ciliary dyskinesia/Kartagener syndrome. Genet Med 2009;11:473–87.
. Efficacy of a saccharin test for screening to detect abnormal mucociliary clearance. Br J Dis Chest 1984;78:62–5.
. Nasal nitric oxide measurements for the screening of primary ciliary dyskinesia. Eur Respir J 2003;21:43–7.
. Non-invasive sampling of nasal cilia for measurement of beat frequency and study of ultrastructure. Lancet 1980;2:564–5.
. Random ciliary orientation: a cause of respiratory tract disease. N Engl J Med 1990;323:1681–4.
. Ciliary dyskinesia in the nose and paranasal sinuses. Acta Otorhinolaryngol Belg 1997;51:353–66.
. Structure and function of mammalian cilia. Histochem Cell Biol 2008;129:687–93.
. Genetic causes of bronchiectasis: primary ciliary dyskinesia. Respiration 2007;74:252–63.
. New DNAH11 mutations in primary ciliary dyskinesia with normal axonemal ultrastructure. Eur Respir J 2010;35:1413–16.
. The study of primary ciliary dyskinesia in difficult cases using electron tomography [abstract]. Am J Respir Crit Care Med 2010;181:A6729. Funding The PCD service is currently supported by the Advisory Group for National Specialised Services (AGNSS). Together with units in Leicester and Southampton, it provides a national diagnostic service for PCD. Ethics approval The study is an audit/review of a diagnostic service and no interventions were performed.